But root canal can be a most effective way to treat some kinds of dental problems, and are often the last treatment that can save a tooth. At A Supa Smile, we are expert in all dental procedures, including the root canal (sometimes called “endodontic therapy”). 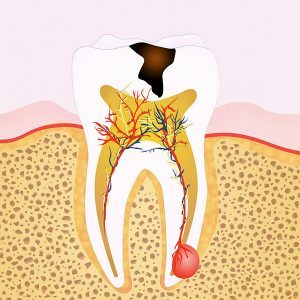 The term “root canal” can refer to both the inner part (passages) of the tooth between the pulp and tooth roots, and to the dental procedure used to remove infected material and relieve root canal pain. The root canals contain nerves and blood vessels. Once an adult tooth has emerged from the gums, the tooth’s nerve senses heat, cold, and other stimuli. Removing a nerve in an infected tooth is part of a standard procedure to treat teeth pain caused by decay or infection in the tooth pulp. Damage: Tooth decay that has penetrated the outer layers of the teeth can cause root canal pain. Decay: Cracks or chips in teeth can cause tooth decay and root canal pain. Disease: Repeated dental procedures in the same area can promote deep tooth decay and root canal pain. If the cause of your teeth pain is serious decay or infection in the tooth pulp, your dentist may recommend a root canal. Many times there are few or no symptoms in a tooth that needs a root canal. This is why it is important to have regular check-ups to try to avoid problems before they become acute emergencies. X-rays often reveal chronic infections at the tip of the tooth or decay, which is either into the pulp or very near it. Mild tooth pain when you eat or drink something that is hot or cold, but the pain is not prolonged. Sharp pain in your tooth when you bite in a certain way. This could be a cracked tooth. Tooth pain when you eat something sweet and sugary, that goes away quickly. Painful teeth, but it’s hard to tell which ones. The pain is also worsened when you are active. This can be sinusitis. Pain in your cheeks or increased pain in your mouth in the morning. You could be grinding or clenching your teeth at night. Of course, if you have any of these symptoms your first step should be a quick call and visit to your friends at A Supa Smile. Do Root Canals Work? Root canal pain is relieved after most root canal procedures. Data from root canal procedures show a 95 percent success rate, and many teeth that are preserved with root canal procedures can last for the rest of your life. How Do I Prevent Root Canal Pain? To help prevent the need for future root canal procedures to relieve root canal pain, follow a regular oral care routine of twice-daily tooth brushing and daily flossing, and see us at A Supa Smiles regularly to check the condition of your root canal treatment and any crowns or fillings. A root canal is not a ‘fun’ treatment, but it is often the best treatment to save a tooth with a dead nerve or serious levels of damage. At A Supa Smile, the root canal process is efficient, effective, and comes without pain. We offer interest free payment plans– fortnightly or monthly payments, on treatments above $1000, over max term of 3 years. We prefer minimum payment of $100/month. Contact us on (03) 9723 0703 or book your appointment online.